To make this process of designing machine learning models much more accessible, we’ve been exploring ways to automate the design of machine learning models. […] in this blog post, we’ll focus on our reinforcement learning approach and the early results we’ve gotten so far. In our approach (which we call “AutoML”), a controller neural net can propose a “child” model architecture, which can then be trained and evaluated for quality on a particular task. That feedback is then used to inform the controller how to improve its proposals for the next round. Should you bother getting fancy about this? Ben Recht argues no, that random search is competitive with highly tuned Bayesian methods in hyperparameter tuning. Let’s ignore him for a moment though and sniff in the hype. 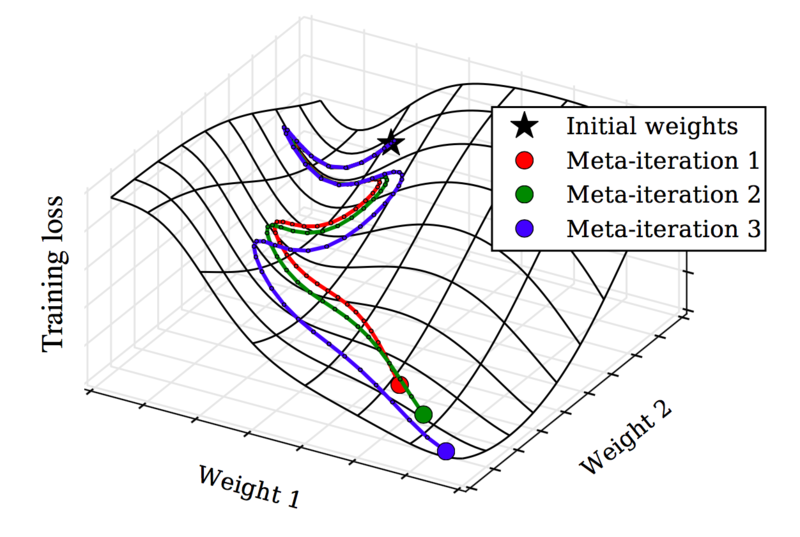 Each meta-iteration runs an entire training run of stochastic gradient de- scent to optimize elementary parameters (weights 1 and 2). Gradients of the validation loss with respect to hyperparameters are then computed by propagating gradients back through the elementary training iterations. Hyperparameters (in this case, learning rate and momentum schedules) are then updated in the direction of this hypergradient. … The last remaining parameter to SGD is the initial parameter vector. Treating this vector as a hyperparameter blurs the distinction between learning and meta-learning. In the extreme case where all elementary learning rates are set to zero, the training set ceases to matter and the meta-learning procedure exactly reduces to elementary learning on the validation set. Due to philosophical vertigo, we chose not to optimize the initial parameter vector. Their implementation, hypergrad, is cool, but no longer maintained. auto-sklearn frees a machine learning user from algorithm selection and hyperparameter tuning. It leverages recent advantages in Bayesian optimization, meta-learning and ensemble construction. [drmad distills] the knowledge of the forward pass into a shortcut path, through which we approximately reverse the training trajectory. When run on CPUs, DrMAD is at least 45 times faster and consumes 100 times less memory compared to state-of-the-art methods for optimizing hyperparameters with almost no compromise to its effectiveness. AFAICT this is the only one shipping an actual gradient-based hyperparameter optimisation method that uses hyperparameter gradients – the rest infer a proxy function for hyperparameter choice. Paper: FLFL16. […]is a simple and efficient library to minimize (very) expensive and noisy black-box functions. It implements several methods for sequential model-based optimization. Spearmint is a package to perform Bayesian optimization according to the algorithms outlined in the paper (SnLA12). The code consists of several parts. It is designed to be modular to allow swapping out various ‘driver’ and ‘chooser’ modules. The ‘chooser’ modules are implementations of acquisition functions such as expected improvement, UCB or random. The drivers determine how experiments are distributed and run on the system. As the code is designed to run experiments in parallel (spawning a new experiment as soon a result comes in), this requires some engineering. Spearmint2 is similar, but more recently updated and fancier; however it has a restrictive license prohibiting wide redistribution without the payment of fees. You may or may not wish to trust the implied level of development and support of 4 Harvard Professors, depending on your application. Both of the Spearmint options (especially the latter) have opinionated choices of technology stack in order to do their optimizations, which means they can do more work for you, but require more setup, than a simple little thing like skopt. Depending on your computing environment this might be an overall plus or a minus. (sequential model-based algorithm configuration) is a versatile tool for optimizing algorithm parameters (or the parameters of some other process we can run automatically, or a function we can evaluate, such as a simulation). SMAC has helped us speed up both local search and tree search algorithms by orders of magnitude on certain instance distributions. Recently, we have also found it to be very effective for the hyperparameter optimization of machine learning algorithms, scaling better to high dimensions and discrete input dimensions than other algorithms. Finally, the predictive models SMAC is based on can also capture and exploit important information about the model domain, such as which input variables are most important. We hope you find SMAC similarly useful. Ultimately, we hope that it helps algorithm designers focus on tasks that are more scientifically valuable than parameter tuning. is a Python library for optimizing over awkward search spaces with real-valued, discrete, and conditional dimensions. Hyperopt has been designed to accommodate Bayesian optimization algorithms based on Gaussian processes and regression trees, but these are not currently implemented. All algorithms can be run either serially, or in parallel by communicating via MongoDB. BBBK11: James S. Bergstra, Rémi Bardenet, Yoshua Bengio, Balázs Kégl (2011) Algorithms for hyper-parameter optimization. In Advances in Neural Information Processing Systems (pp. 2546–2554). Curran Associates, Inc.
FLFL16: Jie Fu, Hongyin Luo, Jiashi Feng, Kian Hsiang Low, Tat-Seng Chua (2016) DrMAD: Distilling Reverse-Mode Automatic Differentiation for Optimizing Hyperparameters of Deep Neural Networks. In PRoceedings of IJCAI, 2016. FKES15: Matthias Feurer, Aaron Klein, Katharina Eggensperger, Jost Springenberg, Manuel Blum, Frank Hutter (2015) Efficient and Robust Automated Machine Learning. In Advances in Neural Information Processing Systems 28 (pp. 2962–2970). Curran Associates, Inc.
FoDN08: Chuan-sheng Foo, Chuong B. Do, Andrew Y. Ng (2008) Efficient multiple hyperparameter learning for log-linear models. In Advances in Neural Information Processing Systems 20 (pp. 377–384). Curran Associates, Inc.
Domk12: Justin Domke (2012) Generic Methods for Optimization-Based Modeling. In International Conference on Artificial Intelligence and Statistics (pp. 318–326). LJDR16: Lisha Li, Kevin Jamieson, Giulia DeSalvo, Afshin Rostamizadeh, Ameet Talwalkar (2016) Hyperband: A Novel Bandit-Based Approach to Hyperparameter Optimization. ArXiv:1603.06560 [Cs, Stat]. SSZA14: Jasper Snoek, Kevin Swersky, Rich Zemel, Ryan Adams (2014) Input Warping for Bayesian Optimization of Non-Stationary Functions. In Proceedings of the 31st International Conference on Machine Learning (ICML-14) (pp. 1674–1682). SwSA13: Kevin Swersky, Jasper Snoek, Ryan P Adams (2013) Multi-Task Bayesian Optimization. In Advances in Neural Information Processing Systems 26 (pp. 2004–2012). Curran Associates, Inc.
SnLA12: Jasper Snoek, Hugo Larochelle, Ryan P. Adams (2012) Practical bayesian optimization of machine learning algorithms. In Advances in neural information processing systems (pp. 2951–2959). Curran Associates, Inc.
GAOS10: Steffen Grünewälder, Jean-Yves Audibert, Manfred Opper, John Shawe-Taylor (2010) Regret Bounds for Gaussian Process Bandit Problems. (Vol. 9, pp. 273–280). EFHB00: Katharina Eggensperger, Matthias Feurer, Frank Hutter, James Bergstra, Jasper Snoek, Holger H. Hoos, Kevin Leyton-Brown (n.d.) Towards an Empirical Foundation for Assessing Bayesian Optimization of Hyperparameters.